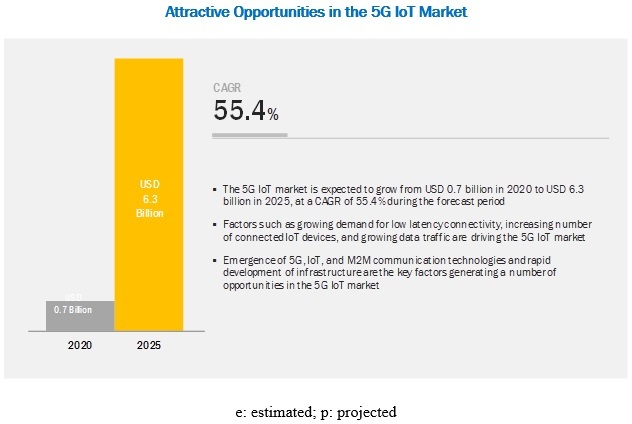 [100 Pages Report] MarketsandMarkets forecasts the global 5G IoT market size to grow from USD 0.7 billion in 2020 to USD 6.3 billion by 2025, at a Compound Annual Growth Rate (CAGR) of 55.4% during the forecast period. IoT has been radically changing consumer and business landscape over the past few decades. The number of connected devices is expected to reach around 22 to 25 billion by 2025 ranging from consumer wearable devices and industrial devices to connected cars. The diverse set of connected devices from a range of industry verticals needs a unique communication infrastructure. In addition, these connected devices require low power, faster connectivity, and higher security. Today, several connectivity technologies are available in the market, such as non-cellular, non-carrier, cellular IoT, and satellite network. Bluetooth, Zigbee, Long Range (LoRa), Sigfox, LLow-power Wide Area Network (LPWAN), Radio-frequency Identification (RFID), Bluetooth Low Energy (BLE), Wireless Local Area Network (WLAN), and Long-Term Evolution (LTE) (Category M1 (Cat-M1) and Narrowband-IoT (NB-IoT)) are some of the key options available in the market for IoT connectivity. Enterprises are leveraging these communication techniques as per the demand and requirement of the IoT network. The overall adoption of 5G NR standalone architecture is expected to increase during the forecast period, owing to a wide range of functionalities and core features that the architecture provides. The 5G NR standalone solutions have various built-in capabilities such as network slicing, ultra-low latency, Control and User Plane Separation (CUPS), multi-Gbps support, and virtualization. 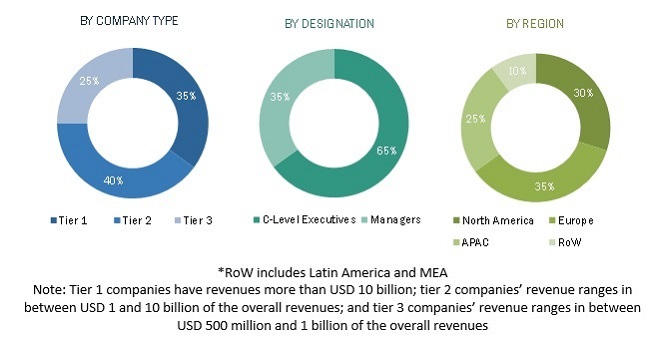 The geographic analysis of the smart cities market comprises 5 regions, namely, North America, APAC, Europe, Middle East and Africa (MEA), and Latin America. North America held the highest share in the 5G IoT market in 2020, owing to the increasing number of connected IoT devices in the region. North America comprises the US and Canada and is one of the leading regions in terms of the development of 5G IoT. Verizon has planned to roll out 5G services across 30 cities in the US by the end of 2020. T-Mobile has also announced to launch 5G services in 30 cities. AT&T has already introduced 5G services in 12 cities. These service providers have collaborated with network enablers such as Ericsson, Nokia, and Samsung, to launch 5G services across the US. 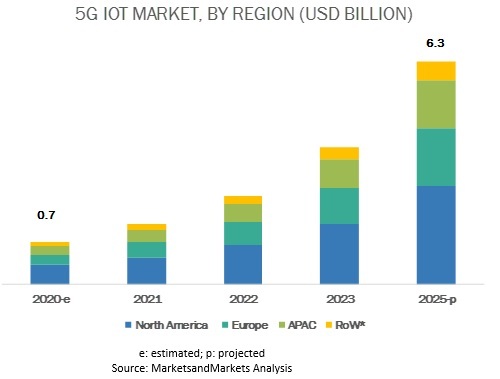 In the 5G IoT market, the key and emerging market players include Ericsson (Sweden), Nokia (Finland), Huawei (China), AT&T (US), Verizon (US), Sprint (US), Telefónica (Spain), BT Group (UK), Vodafone (UK), Telstra (Australia), Etisalat (UAE), Telus (Canada), Bell Canada (Canada), Singtel (Singapore), and Rogers (Canada). These solution providers are the leading vendors in the 5G IoT market. They have adopted organic and inorganic strategies, such as new service launches, acquisitions, collaborations, and partnerships, to expand their business reach and drive their business revenues. In February 2019, Nokia partnered with Korea Telecom (KT) for conducting trails of 5G Network Function Virtualization (NFV) and network slicing. Nokia will also help KT to enhance 5G service and network operational efficiency. In February 2019, Nokia collaborated with Vodafone on active antennas to boost 5G radio capacity and reduce the total cost of ownership. In December 2018, Telefónica and Nokia signed an MoU in which both the companies agreed to build “Early 5G Innovation Cluster" in Berlin. This innovation cluster will provide a platform to test Nokia’s 5G technology under real-life conditions with subscribers of Telefónica Deutschland network. In July 2018, Telstra in collaboration with Ericson and Intel completed the world’s first end-to-end 5G non-standalone data call on a commercial mobile network. This call was made using 3.5GHz spectrum, Intel’s 5G mobile trail platform, and Ericsson’s commercial 5G NR equipment. In June 2018, Sprint partnered with NXM Labs, a blockchain IoT security company, to launch the first 5G-Ready Connected Car platform with the IoT blockchain security feature. This platform helps in ensuring the security of families through smart parental control and anti-theft. Additionally, it helps in keeping track of driving expenses and finding nearby parking. In June 2018, Sprint is planning to partner with Adaptive Motion Group (AMG) to deploy Mobi, a self-driving robot that helps in charging industrial vehicles, electric buses, and cars. The robot would move using artificial intelligence, Sprint’s 5G mobile network, and the IoT technology. The company would be deploying 5G network in the first half of 2019. In February 2018, AT&T acquired FiberTower Corporation for USD 207 million. As per this acquisition, FiberTower Corporation provides 39 GHz and millimeter spectrum to AT&T for helping it launch its mobile 5G services. What are the upcoming trends in smart city platform solutions? What are the competitive developments, such as mergers and acquisitions, new product developments, and business expansion activities, in the market.? How major factors, such as drivers, restraints, opportunities, and challenges, influence the growth of the market? What are the key roles of major players in the 5G IoT market? The study involved 4 major activities to estimate the current market size of the 5G IoT market. Exhaustive secondary research was done to collect information on the market, peer market, and parent market. The next step was to validate these findings, assumptions, and sizing with the industry experts across value chains through primary research. Both top-down and bottom-up approaches were employed to estimate the complete market size. Thereafter, the market breakup and data triangulation procedures were used to estimate the market size of the segments and subsegments of the 5G IoT market. In the secondary research process, various secondary sources, such as D&B Hoovers, and Bloomberg BusinessWeek, have been referred to, for identifying and collecting information for this study. These secondary sources included annual reports; press releases and investor presentations of companies; whitepapers, certified publications, and articles by recognized authors; gold standard and silver standard websites; crypto asset management technology Research and Development (R&D) organizations; regulatory bodies; and databases. The market size, in terms of value, was determined through primary and secondary research processes. All percentage shares, splits, and breakups were determined using secondary sources and verified through primary sources. With data triangulation and validation through primary interviews, the exact value of the overall parent market size was determined and confirmed using this study. The overall market size was then used in the top-down procedure to estimate the size of the other individual markets via percentage splits of the market segmentation. Connection, Radio Technology, Range, Verticals, and Regions.